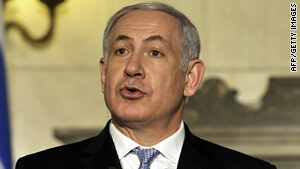 Israeli Prime Minister Benjamin Netanyahu welcomed the invitation for talks. (CNN) -- The reaction to the U.S. invitation for direct talks between Israelis and Palestinians next month was swift. -- Israeli Prime Minister Benjamin Netanyahu welcomed the invitation and said he was "pleased with the American clarification that the talks would be without preconditions." "Reaching an agreement is a difficult challenge but is possible. We are coming to the talks with a genuine desire to reach a peace agreement between the two peoples that will protect Israel's national security interests, foremost of which is security," said Netanyahu, who wants "serious and comprehensive talks." -- Saeb Erakat, the chief Palestinian negotiator, said he would "view this as a last shot and stressed the importance of Israel extending its moratorium on settlements scheduled to expire later in September. "I hope Mr. Netanyahu can make the choice for peace and not settlements," he said. Palestinian President Mahmoud Abbas and Palestine Liberation Organization officials were studying the invitation. -- Hamas, the anti-Israel group that runs Gaza -- rejected the talks. Sami Abu Zohri, Hamas spokesman, said that "till now all these negotiations did not achieve anything. These negotiations will not be accepted by the Palestinian people because it is a new trap for the Palestinians." -- The Middle East Quartet -- made up of the United Nations, Russia, the United States, and the European Union -- underscored its full commitment to the talks. "The Quartet again calls on both sides to observe calm and restraint, and to refrain from provocative actions and inflammatory rhetoric," it said. -- George Mitchell, the U.S. special envoy to the Middle East, said the United States will continue to push for peace between Israel and Palestinians with "patience, perseverance, and determination." Mitchell acknowledged there will be obstacles in the road ahead but said he believes Netanyahu and (Mahmoud) Abbas are "sincere, and serious, and believe it can be done" within a year. Reaction rolled in from American groups. -- The Anti-Defamation League, a U.S. civil rights group, called the announcement a "welcome development." -- J Street , a liberal Jewish lobbying group, said it applauded "President Obama's leadership and the work of Secretary (of State Hillary) Clinton" and Mitchell "in bringing the parties to the table."